Purchase Ken Zylla Art Prints online from ArtBarbarians.com located in Minnesota. One of the most unique prints we sell are those from this great artist. 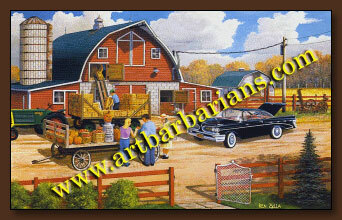 Ken Zylla art prints are very popular for the way they portray everyday life in rural settings. The colors he uses are truly vibrant and there is a hometown theme somewhat reminiscent of an artist like Grant Wood. 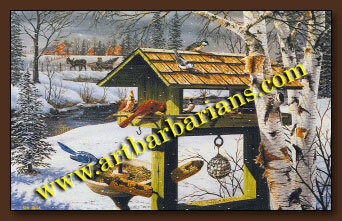 Like most people you probably can identify with these tranquil scenes of common life we feature here on our web site. Here we have a couple of examples of this fine artist's work. You get a sense of life and perhaps an idealistic feeling about the goodness of people and the beauty of nature so richly embellished. These great Ken Zylla art prints stem from beginnings in art go back over forty years to a time and place where wildlife and nature provided the foundation for his career. As a native Minnesotan, he enjoyed unlimited access to the lakes, woods and rivers...an opportunity to become acquainted with nature that would eventually merge with his interest in art. Self taught Ken's success has been built on experimenting with color and technique. The unique style of Ken's painting has earned him the distinction of being one of the few artists who are recognized by their work. Throughout his career, Ken has distinguished himself for creating a dimension in his compositions that truly bring his paintings to life. As you study his work, it is easy to appreciate the story-telling ability that describes the detail of an event or place that you may have experienced yourself. With bold color and attention to detail, Ken creates a dialogue with the everyday pieces of our lives. His blending of the elements, such as weather, sunlight, time of day, the seasons, along with his choice of subjects, bring each painting to a precise place in time. Ken has had numerous successful shows. His work is displayed in several corporate and private collections throughout the United States and several foreign countries. Call us if you have any questions about anything you see on our web site or need to know more about Ken Zylla art prints. We're happy to answer your questions personally regarding availability or something special you're looking for.